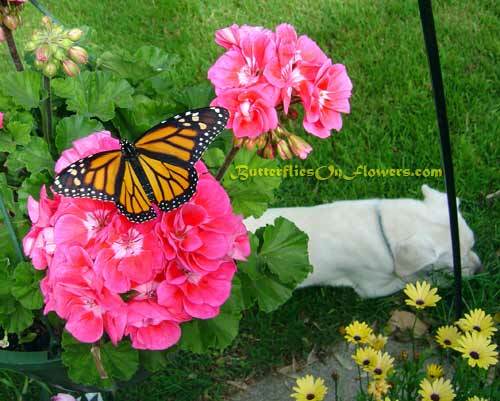 Caption: A Female Monarch Butterfly (Danaus Plexippus) spreads her wings on a pink Geranium (Pelargonium x hortorum) as the family dog munches on some weeds. What I like about this shot really isn't so much about flowers and butterflies, but rather our family dog, Lina. This still-rambunctious 10 year old pit/lab mix gets extremely jealous when I'm snapping photos of the monarchs outside. Her typical response is to plant herself right down in front of me and start devouring flowers or weeds in hopes of diverting my attention. I usually chase her off before snapping photos, but I thought it would be funny to let her co-star in one. Butterfly facts: One female butterfly will lay, on average, 700-800 eggs during her lifespan. If the summer is extremely hot and dry she will lay less.